The summer war that has raged between Hamas in Gaza and Israel has left the Islamist terrorist organization battered and bruised. Its offensive tunnel capabilities lie in ruins, while its rocket arsenal near depletion. The war began when Hamas launched heavy rocket salvos at Israeli cities in July, and then rejected multiple Egyptian-media truce offers. Hamas's decision to go to war proved to be very costly, and it is now attempting to salvage some gains through a round of indirect negotiations with Israel in Cairo. Israeli intelligence agencies heard chatter in Gaza about an impending conflict several months before it began. The Israel Defense Force's Southern Command quietly prepared for the clash, and senior army sources say the fruit of these diligent preparations are apparent today. Despite its bravado, claims of victory, and public rhetoric, and irrespective of its long list of demands, many of which are unrealistic and will not be met – like Hamas's demand for a seaport in Gaza – Hamas is negotiating from a position of weakness. Its posturing is aimed at domestic consumption, and is also an attempt to convince the Israeli public that the mere fact Hamas survived the war, and continued shooting projectiles, represents a defeat for Israel. In fact, Israel deliberately refrained from seeking to destroy Hamas's military wing, the Ezzedeen al-Qassam Brigades. The defense establishment believes that it is in Israel's interest to have a weakened, single address in Gaza, responsible for governing the Strip, and capable of enforcing a truce. Most importantly, any entity ruling Gaza must be responsive to Israeli deterrence. If Hamas is toppled, the reasoning in the Israeli defense establishment goes, it may be replaced by an assortment of jihadist militias, creating an even more chaotic situation in which deterrence becomes impossible, and where Gaza would resemble Somalia. The first two stages of the Israeli operation against Hamas – air strikes and a limited ground offensive – test the idea that Hamas can still be deterred. Should Hamas resume hostilities and prove that it is immune to deterrence, despite the wide-scale damage it has brought on itself and to the people of Gaza, the IDF has prepared operational plans for a full-scale ground offensive into the Gaza Strip, aimed at the destruction of Hamas's military wing. IDF ground forces continue to be positioned along the Gaza border, and await instructions from the security cabinet after completing preparations for the possibility of renewed fighting. A damage assessment of Hamas's military capabilities thus far reveals the true extent of the price it has paid for its aggression against Israeli civilians. During the war, the IDF destroyed nearly 5,000 targets, most of which were planted by Hamas deep inside Gaza civilian areas. The targets included 1,700 rocket launchers and sites used to store the projectiles. Hamas lost around 1,000 command and control centers – most of which were based in the homes of Hamas field commanders. Another 1,000 targets that threatened advancing IDF units on the ground were destroyed. Israel also struck 240 Hamas regime buildings that were used by its military wing in terrorist-guerilla operations, 200 rocket factories, and a myriad of additional targets. Gaza terror factions began the war with an arsenal of about 9,000 rockets. Today, under a third of that arsenal remains, due to depletion or destruction by Israel Air Force strikes. Rocket attacks proved highly ineffective in Hamas's goal of sowing death and destruction in Israeli cities. Nevertheless, daily rocket attacks on millions of Israelis paralyzed ordinary life and spread fear among the public. It was the performance of the Iron Dome air defense system that prevented mass casualties and large-scale wreckage in Israel. Nine Iron Dome batteries deployed across Israel intercepted 90 percent of all targeted rockets heading towards populated Israeli regions, while the remainder of rockets mostly fell in uninhabited areas. Some 3,400 rockets were fired into Israel, and Israeli civilians were forced to deal with the psychological terror and daily disruption of air raid sirens, and the need to quickly take cover. In physical terms, however, Hamas's rocket arsenal was rendered largely useless by Iron Dome. All of the rockets fired by Hamas were produced in Gaza's flourishing arms industry, which rose up after Egypt blocked smuggling tunnels linking the Strip to the Sinai Peninsula. Previously, those tunnels were used by Iran to export weapons to Hamas. Israeli villages and agricultural regions bordering the Gaza Strip fared worse than the rest of the country. These areas were exposed to constant mortar shells fired from Gaza and the threat of cross-border tunnels. Residents abandoned much of the area, becoming internally displaced persons during the war. Hamas's second disappointment came when its elaborate network of underground attack tunnels it dug from Gaza into Israel were destroyed before they could be used in grand terrorist attacks against Israeli border villages and army bases. Hamas spent tens of millions of dollars building the heavily fortified tunnels, which were supposed to be used to launch indiscriminate killing sprees and kidnap soldiers. Although a few of the tunnels were used by Hamas cells to launch deadly raids on Israeli army units that protected villages in the south of the country, the majority of the tunnels had been mapped out by military intelligence, and were destroyed during the course of the ground offensive. During this stage of the fighting, Israeli infantry, armored, and combat engineering units reached tunnel shafts, and proceeded to destroy the underground structures using liquid explosive. Hamas's regional battalions mounted a stiff defense of the tunnels, firing a very large number of RPGs, mortar shells, sniper rounds, and automatic fire from Palestinian civilian areas at the army. Hamas guerillas used an internal Gaza tunnel network to launch hit-and-run attacks. They also booby-trapped large numbers of Palestinian residential buildings. 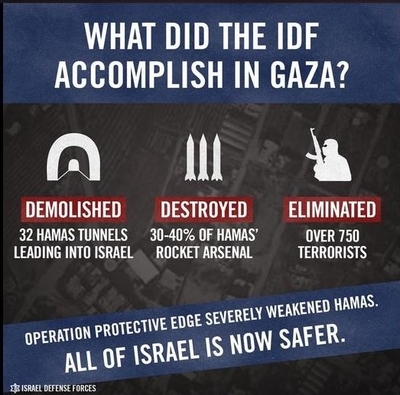 Nevertheless, the IDF destroyed all of the attack tunnels – 32 it knew about – taking two weeks to complete the mission. It took Hamas five years and a great deal of treasure to build up its underground warfare capability, but this was ruined by the Israeli army in little time. The tunnels, complete with telephone lines, electricity, and rail cars, were built with cement sent into Gaza for the purpose of civilian construction projects, such as schools and medical clinics. Sixty four IDF soldiers and officers were killed in the battle to destroy the tunnels, and three Israeli civilians were killed by projectiles. But Hamas, and to a smaller extent, Palestinian Islamic Jihad, lost several hundred terrorists in combat with soldiers. Between 900 and 1,000 terrorists were killed by the army in Gaza clashes, according to Israeli intelligence evaluations. According to Hamas medical sources, nearly 2,000 Gazans were killed in the conflict. That would put the civilian/combatant casualty ratio at roughly 1:1, a rate IDF sources say is one of the lowest in recent wars by a Western military against an asymmetrical foe. By comparison, NATO's operations in Afghanistan have resulted, according to reports, in a 3:1 civilian/combatant casualty ratio. Hamas also spent years developing its own drone program, but when it tried to send these into Israel during the war, the IAF detected the threat and shot them down. Additionally, a Hamas naval commando unit attempted to infiltrate the country via a southern Israeli beach, but it too was detected by the military, and its members were swiftly killed. Israel's operations in Gaza included, for the first time, a fully integrated joint forces command and control network. This system allowed infantry units, navy missile ships, tanks, fighter jets, artillery units and drones to share real-time intelligence on targets, and to synchronize their firepower. All of these forces were also linked up to military intelligence, allowing for new and critical information on threats in the sectors of units in combat to be transmitted in seconds. For example, when the army obtained vital information from Hamas detainees on booby- trapped homes in the vicinity of an infantry unit, information was immediately sent to the infantry commanders, enabling them to take evasive action. The big question now is whether Israel's military success will convince Hamas to end its belligerent course. Tuesday afternoon brought reason for doubt. Three medium-range rockets were fired at the Negev city of Beersheba, prompting swift Israeli air strikes on targets in northern Gaza. Israel recalled its negotiators from Cairo in response, and the coming hours will be crucial in charting the course of future developments. If Hamas chooses to resume attacks on Israel, it is likely that the IDF will be ordered to target the remaining components of Hamas's terrorist-guerilla army. This time around, the goal will be to defeat Hamas, rather than deter it. There is not much that one can count on amidst the boiling chaos that defines the middle-east. The blurred line between fact and fantasy waivers under the heat of the desert sun. It is a land illusion and confusion. Grandiose poetry and Story telling permeates the Arab culture where the news media is tightly controlled by generations of family run oligarchy's. Fictional hero's are created out of thin air to bolster a downtrodden population surviving on a spoon-fed diet of dreams and mirage. And then there is the Koran. The Koran that offers its adherents a safety net for the sin of lying if it is done to support or further the cause of Islam. So Hamas will report to its minions who have barely subsisted under their authoritarian and corrupt rule, that they have, thanks be to G-d, slain Goliath....again. "Keep your eyes on the prize," they will spin. "The sun sets on Israel and rises on Palestine. Don.t look around you. Don't see your home reduced to rubble, rather see your sons who are now martyred and dance in heaven." Stories and flowery poems for the children of ignorance. A continuum of lies built on a sturdy foundation of larger lies.....all to perpetuate dominance, power and control..
Hamas just broke another cease fire.. I'm shocked. How many lies is that now, i have lost count. The good news for Hamas is that President Obama guarantees any peace document Israel signs will be honored. I am sure Israeli's are sleeping a lot more comfortably these days remembering the words of this loyal and steadfast President, who has referred to Israel as a great ally of the US, a best friend and the only democracy in the Arab middle-east...... "that he has Israel's back."